I bet you thought I was hiding because I didn't do well this week. Well that is just wrong!! I did my body test every day this week and I watched my weight go up and down every day, but I was losing a little every time I went down. Pounds to go?? : 14 for my short term goal. 1) Staying aware of my weight on a daily basis. 2) Cutting out Soft Drinks (sniff sniff). 3) Cutting down on the sugar in my coffee. 4) I planned out my lunches for the week. I am super aware of what I am eating every day. 5) I cooked a whole bunch of chicken breasts in Lite Italian Dressing and froze them. I can now grab one and have it in a salad, a wrap, on a sandwich, or by itself. Care to read that label? That is 15 calories for 10 sprays which is plenty to flavor a chicken wrap, a salad, a slice of pizza, anything I care to have it on. I really think that this one of my biggest pluses (or minus as the scale says, Haa Ha Hee Heh) for the week. My goal this week is to do 15 minutes on the Wii Fit every day. I hula hooped a few times but I need to be more dedictaed on a daily basis. 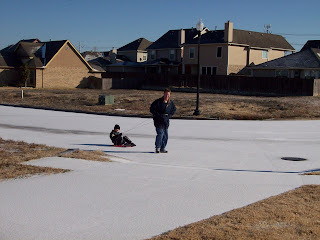 Ice has fallen here in Texas, in the form of sleet. The funny thing is, everyone FREAKS OUT((!!!) 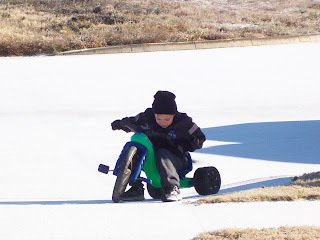 over 1/4 inch of ice on the roads. Schools close, offices close, roads close; which is fine and dandy with me because that means we get a weekend in the middle of the week. Everyone hunkered down the past few days eating soup, enjoying our fire in the fireplace, and playing Lego Batman. I have always had this insatiable urge to finish things.right.now! Well, not everything; laundry, cleaning, dishes, that project I started 2 months ago, yeah, not those things. But books, movies, puzzles, games, and yes, even Lego Batman. We got this magazine about the game because it is Zach's new favorite thing. He even wants his room to made over in it. So it has a walkthrough in it where they walk you through (hence the name, right?) each level of the game telling you hints, tricks, and ways to get all the bonus stuff. Well, we have had this game since before Christmas and he has gotten a lot of the bonus stuff, but needed a few more things that were sprinkled through 15 levels. As I sat down to help him play through a couple, I could feel it welling within me...that need.to.finish.ALL.the.levels.to.day! So we did only to have much disappointment in the "bonus level". This is why I have to read ahead in books. I have the ending at my fingertips; to know how everything turns out, right there. I also tend to skip ahead a few pages and come back and read through that section, then skip ahead a few more hundred pages or so, then read back again. And it is perfectly normal to me. Drives Gary crazy!! (Which I secretly love :-) Now with books I am serious about, I would NEVER do this with like Harry Potter, The Twilight Series, and others. But then I have the problem of having to finish them to.day!! I get nothing done as I race to finish it. 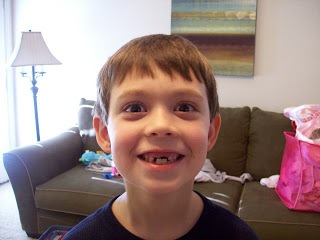 My freshly snaggled-toothed boy as of last week due to a pillow fight with Gary "Makes My Monday". The breakfast casserole was super tasty. I forgot to ask what they thought of it to "quote" them but I remember us all saying we liked it. I put salsa on mine, but they thought that was gross. Anyone else put salsa on their eggs or omelets or is that just me being weird?? As you can see below I am adding breakfast and lunch to my menu. I am really bad about eating lunch during the day. Then I am starving and just grabbing anything that is quick, and usually not healthy. Since I lost a whole huge pound last week, I am inspired to do better. I even got a Diet Pepsi today!! Huge for me. I am also adding the weekends. We sometimes are at a loss in the weekends because it is not "planned". Dinner: Calzones - my new recipe to try for the week. 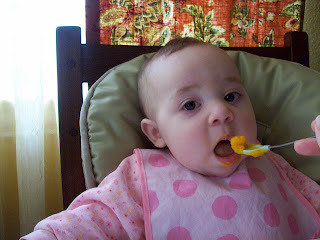 I am going to try and sneak some spinach or sweet potato puree in the sauce. Shhh!! Breakfast: Oatmeal - Steel cut boiled in apple juice - Yummy! Lunch: Tuna - I use a little mayo, grated green apple, dill, and Salad Supreme Seasonings. Dinner: Tacos - I will sneak in another veggie in the taco meat here. First of all, if you only stop by here for the Brag About Friday post every week, then you might want to go back and catch up on this week. 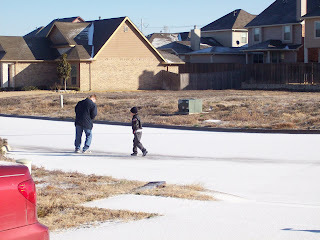 I posted some videos of the kids and told a little ditty about sweet Zachary this morning as well. I am trying to post more during the week and not do a marathon post on Friday since it takes me so long to complete it. This one even took me 4 hours to do in between everything. Guess who is making baby food?? Yep, that would be me! I am a steaming, pureeing, and freezing machine. I just got The Magic Bullet off Ebay and it works so well for what I need. I steam the veggies for a little bit in my steamer, then I put the veggies in the bullet with a little of the water that collected at the bottom of my pan. I love how I can make it super smooth with more water or a bit more chunky. 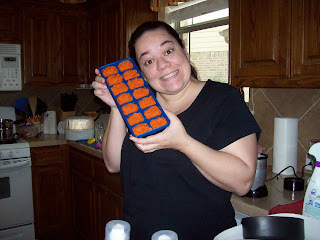 Then I spoon the puree into ice cube trays to freeze. Today I will take them out and put them into labeled baggies to use on a daily basis. So far I have pureed avocados, sweet potatoes, bananas, carrots, and a butternut squash (which I really had to try hard not eat myself, yummy!!). Today I will puree spinach, broccoli, cauliflower, blueberries, squash, peas, and I may try some chicken and rice. 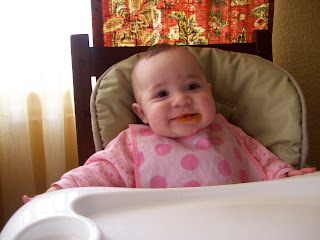 I got my recipes from Annabel Karmel and Wholesome Baby Food. And look who likes it!! No more closed little mouth...well...not as much anyway. Guess who doesn't like it?? I guess she prefers the mush. Oh well. I look over at Zach who is standing right there with us and see tears streaming down his face and him barely holding onto his own sobs. I reached to hug him and he just falls apart. I hug and comfort and send him off to wash his face and ask him what is he going to do when I have to spank their hands, huh? All I hear from the bathroom is sniffles as he tries to calm down. And I hate to admit it but I was fighting back the tears myself at him getting upset, Oy!! I am grateful that I passed down this trait to him. We are both sensitive to others feelings. He would never even dream of being mean to anyone on purpose. He is super sweet and loving because of this sensitive nature. But how much is too much? I don't want him to be bullied or called a sissy because of his emotions. I have the HARDEST time not crying during certain...well, all situations I find difficult. When I had to tell my boss I was sick and need to go home, how do I do it?? Crying. When a parent got upset with me over how I handled a situation, what did I do? Cried. When my dad told me not to interrupt his story...yep, you guessed it...cried!! As an adult, people!! Very rarely can I have a needed confrontation without crying. Do you know how embarrassing that is? How awful for people to not take me seriously because I am crying? I have so much that needs to be said, but all I can do is cry or worse, try to talk through my tears. I do not wish this on him. How do I toughen him up without losing that tender part of himself? Should I even try? Sleep...Oh blessed sleep, where art thou?? We moved the girls into their own cribs several weeks ago even though it broke my heart into pieces. They did better for several days after that and I thought we had found the answer. Then...well...it just went to poop. Let me give you a rundown of our night. Olivia goes down around 7:00. And then she is up every half hour(!!) until about 12:00. This means that one of us is constantly running up the stairs to replace a binky or pop in a bottle or to soothe her back to sleep. After 11:30 or 12:00 she gets up every hour to 2 hours until 7:00. Then she is up bright, sunshiney, ready for her day. And she actually finishes 3 4oz bottles every night! She was down to only one, but maybe she is going through a growth spurt?? And Abby who was sleeping through the night until 5:00 or 6:00 in the morning is now waking every 2 to 3 hours at night. She too is drinking several full bottles. WTH, girlies?? So we are tired...again...and wondering if it will ever get better. You know, when they were tiny I worried about them getting used to sleeping in their swings or bouncers during the day. I just couldn't see myself putting them in the co-sleeper or in their cribs upstairs and having them go down at different times and me being downstairs. It was just so overwhelming. So many MOMs told me it was all about survival and to just make it through. Well, we did and I am grateful to those words of wisdom, but now here we are, in a bad habit rut of sleeping in swings during the day, Olivia being rocked to sleep by me upstairs around 7:00, and Abby being rocked to sleep by Gary in front of the TV around 10:00. I know they need 3 naps a day and I am trying to get them on a schedule, but dang it is hard. Plus, I really want to get them upstairs for naps. (Oh to have the downstairs to myself for an hour without having to worry about waking them.) But I have not the foggiest notion of how to go about transitioning them upstairs for naps. And while we are at it; how to get them to go to sleep on their own and STAY asleep!! And I know people have had great success letting their kids cry it out, but this is not the answer for us right now. I won't say never because maybe in a few months...but I really don't see myself ever letting them CIO. I just cannot do it!! The only time Zach would cry was when he was about 10 months old and I knew he was super tired. He cried for about 10 seconds...and that was pushing it for me. To ask me to put my baby (My BABY!!) in a dark room and leave her there crying and calling for me for 10 minutes??? Will not happen...nope...no...I may just have to go ahead and say never! So we are looking for a different solution to our situation. Plus, (yes, another plus) let's just say I am ok with them fussing and crying with us standing there beside them (I did this with Zachary) how in the world can we soothe one baby to sleep as the other, who is hyper aware of the other, is laying there trying to sleep? Let's say Olivia wakes up and instead of picking her up or putting a bottle in her mouth we let her know we are there but let her fuss. Abby starts waking up and by the time Olivia might be ok about going back to sleep on her own, Abby is awake and crying and that wakes up an almost asleep Olivia!!!!! People!! It is an endless cycle! We are clueless how to go about sleep training them. Anyone have an answer for us? Anyone??? I have ordered 3, yes 3, books and we are hoping the answer lies among the pages of them. Goal met!! I lost a pound. How in the world I did that with the week I had, I have no clue. I am not watching what I eat or how much and I am not exercising. Yeah, so I think my body is just desperate to give me something to look forward to. Aww, thanks. Goal for the week: To take the Body Test every day on the Wii. There is just something about seeing my little Mii person balloon up on the scale that does tend to motivate me. See, it starts off all skinny and crap then the numbers shoot up and the Mii gets bigger and bigger. So much fun, people! Oh yeah and according to it, I am obese. OUCH!! Oh yeah, that stings. But as my friend Scott said I just had two babies, so I am cutting myself a little slack. Also, I plan out our menu every week and we are pretty good about sticking to it. I am also going to start planning my breakfast and lunch on a daily basis. I am awful about remembering to eat a good lunch then I am starving by the afternoon and tend to snack while making dinner. To all my lurkers, thanks so much to those of you who came out last week. I enjoyed going and reading your blogs and "meeting" new moms. This first one is short and sweet; little Olivia saying "Mama". Excuse my corny laugh, I just love hearing her say it. Look at her expression right at the last after I laugh. It is almost like she is wondering what I am laughing about. This one is of Zachary and Abby playing. Watch Abby wipe Zachary's kiss off and Zachary really gets her laughing in the middle of it. Love it!! And of course there's my dorky laugh. Ok, we tried out two new recipes last week. 1st, the Bacon Cheeseburger Chicken. From this point on this dish will be known as Teriyaki Ranch Chicken because it in no way reminded any of us of a cheeseburger. I doubled the sauce and used more chicken because I had a feeling we would need the leftovers. Me: OMG!! Run, do not walk, and get these ingredients today! This is what is for dinner, people! It was so so very good. Gary and I fought over the leftovers and I won this time. Hee hee! Gary: "It was wonderful...I can't believe you ate my leftovers." (Hee hee) He liked it so much that we are having it again tonight. Yep, it is just that good. Zachary: "It was pretty good" complete with head tilt and nodding. 2nd was the Chicken Packets I followed the recipe this first time, but I will add more chicken next time because it was a little too cream cheesy. Well, I take that back. I actually did not put chives in and put Ranch in instead for a little flavor. Me: LOVED them. I had these leftovers too. Yummy yummy! We will def be having this one again. Gary: "They were pretty good"
We didn't get to have it last Friday. I sent Gary out for Sonic because the girls were super fussy and I had had a long day. Have a great one! I have a video of Olivia saying Mama that I will try and upload later today. 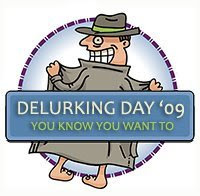 It's de-lurking week!! Here is your opportunity to show yourself. I would love to hear from every one of my regular readers today, especially if you don't usually leave a comment. Just leave me a little love aka-comment. If you don't have a Google account you can leave a comment anonymously. 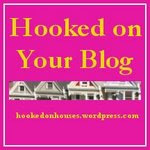 Just sign your name so I know who you are :-) If you have a blog, I will come give you some bloggy love. Wow! I will not bore you with 200 facts of myself. I just wanted to give myself a pat on the back and send some love out to all my readers. Thank you thank you thank you!!!! I love you all and really appreciate you all for coming back again and again. I posted a ton of posts on Friday so go get caught up. Menu Planning is coming soon. I SO did not want to post this today since I have gained about 4 pounds over the holidays. But it could be worse right? And I have to keep this up! It is one of my resolutions. A fresh start today. From here on out I will post how many pounds lost or gained. 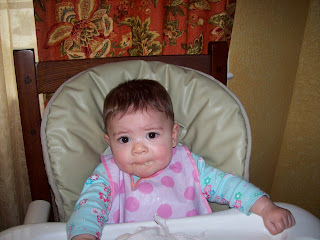 I have joined a Moms of Multiples weight loss blog. So I am really hoping that will help me stay accountable. That's it. Wish me luck this week. Update: Yeah, I forgot my goal for this next week: To lose 1 pound. That's it!! Just 1. Look whose sitting up all by herself!! And I had to post these with both of them sitting up. Olivia is almost there, but usually ends up like this after 5 minutes. Wow! Who could use a free bottle of shampoo or conditioner? It will take a few weeks to get the coupon in the mail, but worth it I say!! As I was sifting through photos to post today for the Way Backness, I have to say that my eyes filled with tears more times than once. Especially on the heels of yesterday's post about how big he is getting. Sniff...Sniff....sniff....ok I gotta go to bed before I just start bawling right here. I am just now getting to these, sorry!! I do love getting these...yes, yes, I do. They make me feel speshawl!! And I am so sorry I am just getting to them now. This award represents this: "These blogs are exceedingly charming. These kind bloggers aim to find, and be friends. They are not interested in self-aggrandizement. Our hope is that when the ribbons of these prizes are cut, even more friendships are propagated. Please give more attention to these writers." Awwwawww!!! Me?? Thanks, Elyse, really. It is great to have found you in this blog world of friendship. If have already been awarded this, then just relish in the fact you have a lot of friends. 1) Choose the 4th folder where you store your pictures on your computer. So here is my picture - Don't you just love what my mouth is doing?? And I am really sorry but...who gave me this?? like I did with The Superior Scribbler Award over there? Ah well, if you did give it to me thank you so so much! Oh my baby. My baby ya'll, is almost 7 years old. Dang! That makes me feel old. I guess I should put his stats too, huh?? He is 60 pounds and 4'2". Just about a foot under me. He will surely be taller than me sooner than I want. He is reading. Not just "reading" like when they start off looking at the pictures to identify words, but really looking at any word and reading it. He reads things off the T.V. on signs, on papers, everything. Wow! He wants to grow his hair out like his cousin Jordan, see below. That is Jordan in the white t-shirt, Collin in the navy and Z in the orange and navy. I say let him. Who cares? right?? Hmmm...the debate goes on at our house. His Daddy is not too crazy about it either. 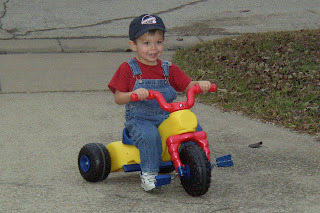 This is the rocket he got for Christmas, one of his favorite gifts. He still wants to be a weatherman only now he has added a rocker to it, so a rock and roll weatherman. Hey, it could happen. He is still very much into art, drawing, and creating. He still loves Science, and really dislikes sitting at his desk doing worksheets all day. He talks. Non.stop. All the time. All.the.time, people! About anything and everything, the sky, a commercial, what so and so said at school. And the way he phrases things! You would think an adult was talking. He uses words like particular, actually, and others that neither Gary or I can think of right now. He asks questions that boggle our minds and leave us stumped at where it came from. He is terrified of getting in trouble. I promise I never beat him! He just got my sensitive nature, I guess. He still hardly ever gets in trouble, but I can tell we will have to start nipping the attitude in the bud here lately. He still tears up quite easily, when he is sad, and when his little heart gets touched. We both cried at the end of that American Girl movie, Kit Kitrich or whatever is was called. I know it will help him out in life to have such a sensitive nature, but I really hope he only has a small portion of my overly sensitiveness. I sent him off to school this morning in tears because he thought we might get in trouble for missing school for Disney World. Oy! This child of mine is ticklish under his chin and still pretends he doesn't want me to get tummy sugar. We have a goodnight handshake we do every night along with our kisses and hugs...and one more kiss. He still has his blanket, what's left of it, and still needs a nightlight plus the hall light on to sleep. He still cuddles when he has time in between the video games and Hot Wheels. Needless to say the whole idea of trying out all those new recipes went right out the window. We haven't eaten out this much in a very long time. Outback was yum yum good! I had a fillet and it was just the best ever! We actually took the girls and sat down and ate with them, a first for us. Any previous meals out have been buffet or super quick like Pei-Wei. They did pretty good. The worst is when they are constantly trying to grab anything and everything off our plates. And every time we drink out of a glass they want to too. They can officially sit in their highchairs with those padded seat covers. So we have opened a whole new door. Fun fun!! Place sugar and cinnamon into a large ziploc bag and shake well to combine. Cut the biscuits into quarters and place several at a time into the bag. Shake to coat with the cinnamon sugar. Lay coated pieces into a Bundt pan, interspersing nuts and raisins amongst the pieces. Melt the butter and brown sugar in a small pan and let boil one minute. Pour over the biscuit dough. Bake at 350 degrees for about 25 minutes. Allow to cool for 10 minutes before turning out onto a plate. Serve warm - just pull the bread apart with your fingers and enjoy!! The thing I forgot when I practiced making it the first time was that it rises. So only fill the pan about half way full. I use two small Bundt pans, but you could get away with using a loaf pan I think. Oh, my sweet sweet Abby Girl, my Abby Dabby Doo, my Abby Sue. This child is a true delight. She is the happiest little thing! When I walk into the room, she just positively lights up. I swear she says, "Hi!" or something like it. She smiles and squeals and just wiggles her whole little body when she sees us. She is a cuddler. She just folds herself into me and tightens her whole body like she is giving me a hug without squeezing. She loves kisses and will give us open mouthed ones right back (yummy). She is so soft and squishy that I could just cuddle her close all day long. She loves loves music. And she dances when I hold her and sing. It is the cutest thing ever. It takes her a little bit to get started but she gets her groove going with her head going back and forth and her body just follows along. I have got to get it on video to share with you. One night she trying to get my attention by making a noise at me over and over. When I finally looked over at her she jumped up and down and just grinned at me. She babbled on and on as she rocked the exersaucer back and forth. She is definitely Daddy's girl, no doubt about that. She only eats for him and mostly wants him to put her to sleep at night. Which she fights tooth and nail on. She fights and jerks and cries, she so does not want to go to sleep. When she does finally give into it, she just lays there in our arms with her eyes closed and talks and babbles and sings until she goes to sleep. She is hard to get to sleep but then more often then not, this little angel sleeps through the night. Lucky Daddy. She has so many facial expressions. In the course of a minute, she will look a dozen different ways. Her queen look is one of my favorites, where she looks down her nose at us. She loves to chew on her hands and tags. She loves tags! Which is so funny to me because Zachary gagged when he touched tags. He had to have me cut every tag off of every animal, pillow, everything he could get away with. But this is about Abby, right? Tags are her friend. She loves to eat play with her sister. She is really tired of laying back. She tries to flip out of the bouncer and succeeded once. Separation Anxiety has set in a little bit. She will sit like this a lot with her hand up by her head. She will flip over to her to her tummy right away when you put her on her back, but then she fusses and fusses. It is like she has forgotten that she can roll the other way. She loves to play Peek a Boo and just belly laughs at Zachary when he plays with her.